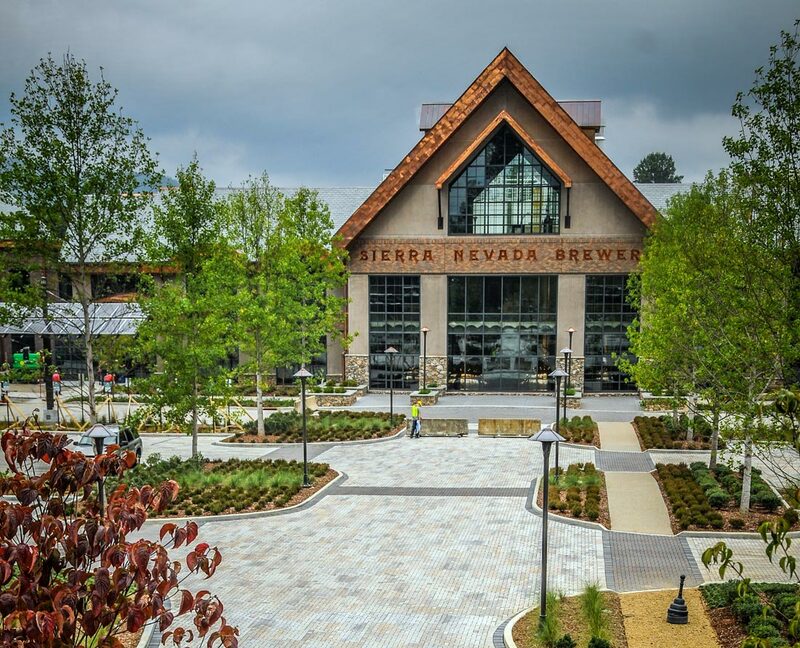 In planning the hardscapes area for a Sierra Nevada Brewing Company brewery near Asheville, NC, Drake Fowler knew the only solution to meet the environmental and aesthetic needs of this conscientious, high-standards company was Belgard Permeable Interlocking Concrete Pavers (PICP). The chosen blend of Aqua Roc II pavers satisfied all of the construction goals with the ability to withstand heavy vehicular traffic, reduce stormwater runoff, meet ADA requirements for foot traffic, and offer long-lasting durability and a favorable solid reflexivity index (SRI). Named after the favorite hiking grounds of founder Ken Grossman, the Sierra Nevada Brewing Company has had a commitment to the environment since day one. With a firmly held belief that the best beer is born of the purest ingredients, their environmentally conscious business model holds particular respect for the purity of mountain water, since it is their principle water source and makes up more than 90% of their beer products. When planning their second location that sits above the French Broad River in the Appalachian Mountains, the Grossman family insisted the facility take the utmost care in protecting the neighboring water supply, both during and after construction. The PICP system was only the first part of a coordinated stormwater management system that incorporated rain gardens, a cistern, and an overflow dry stream bed with a series of 20 checked dams, all designed to filter water to make sure no sediments or pollutants get to the river. “It’s an amazing system. Surface water is not an issue. With Belgard PICP, you can shoot a firehouse at it, and it permeates. But if the cistern overflows due to heavy rain, we want to treat that water and control its route to the river,” Fowler said. One particular project goal was particularly challenging to meet. 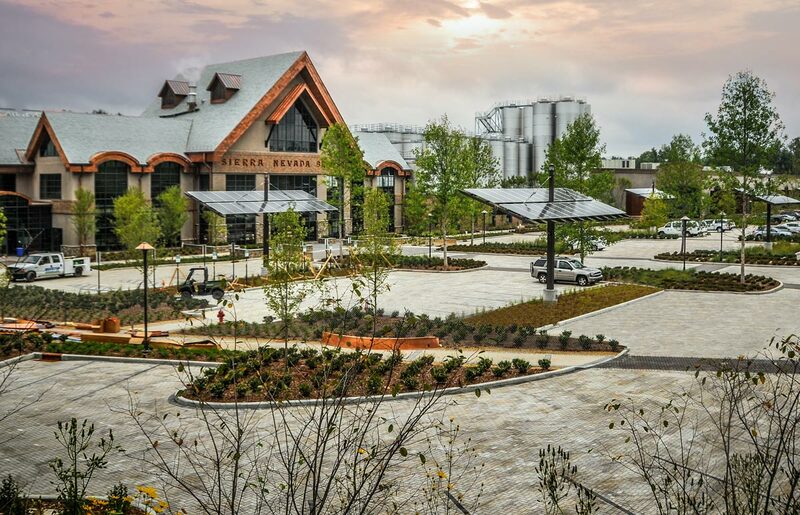 The brewery wanted to protect the beauty of the surrounding viewshed and look as though they had always existed as a part of the natural landscape. Creating a landscape design that already looked mature and natural required the hardscape and landscaping phases to be pushed to an earlier part of the overall construction schedule. According to Atema, the heavy construction traffic would have caused unsightly and costly damage to traditional pavement, but because the Belgard system was constructed of individual pavers that distribute weight differently than traditional pavement and can be easily replaced if individually damaged, construction traffic was not an issue. However, weather complications did wreak havoc on the production schedule when twice the amount of usual rainfall occurred during construction. “We had delay after delay, but Belgard stored the material until we were able to work,” said Atema, whose crews worked weekends to make up the time. Current hardscape applications on the property include driveways, parking lots, crosswalks, and a plaza. For the overwhelming majority of the project, the Limestone paver color was selected due to its SRI index and ability to reduce the possibility of creating a heat island effect, which could otherwise increase the temperature of runoff and potentially harm the ecosystem. The parking lot design incorporated a herringbone pattern that called for the use of half-sized pavers for the parking stalls and lines. “When you cut PICP, it’s hard to keep a consistent joint, so using those half pavers here was good,” Fowler said. The team used the leftover half-sized pavers to create a beer bottle-shaped design in the employee break area. Additional work is still in the design phase for a pub and music venue that will include an outdoor terrace, beer garden, and amphitheater. The expansion project will incorporate an estimated additional 15-20,000 square feet of pavers and is planned to begin construction in the Spring of 2015.